Just a quick freebie this week as I am short of time due to me going on holiday tomorrow. We are away for 10 days so I have put a closed notice on my website store as I shan't be able to send out any templates while I am away. We are staying in the UK this time and looking forward to getting in some nice walks weather permitting. !! The freebie is a simple cutout card which I decorated with an acetate butterfly I found in my stash. Hope you like it. Thank you for this pretty file. Enjoy your holiday. Very pretty,it will be lovely to put my odd leftover toppers on Thank you. Thank you Shirley for all the beautiful files that you share with us. Thank you for the lovely design. Enjoy your holiday! Thank you so much for another great file. 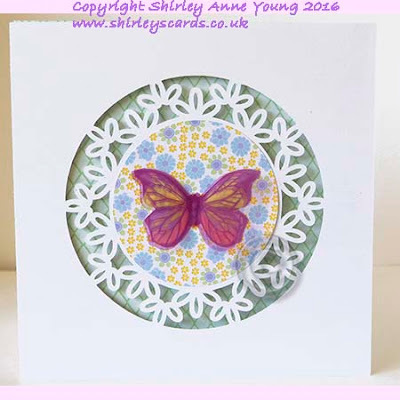 Thank you for your lovely butterfly card. You are very generous to share so many files with us! Vos cartes sont toutes magnifiques. So pretty, Thank you so much for your items.